Not sure where to start on this one but the New York Islanders clearly sought out revenge against the Penguins and most notably goaltender Brent Johnson. The Islanders put up 9 goals in a 9-3 victory against the Penguins but no ones going to remember the score of this one. 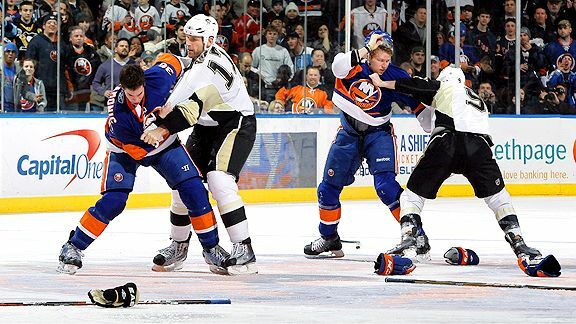 The Islanders and Penguins combined for 346 penalty minutes in a slug fest that included 16 fighting majors and two huge brawls. Pittsburgh had a team record 163 penalty minutes. One that was topped off with Brent Johnson fighting once again, this time taking on Michael Haley who was fighting Max Talbot at the other end of the ice then skated down to Brent Johnson who held his own and got a couple punches in on Haley before Eric Godard came flying off the bench to Johnson’s defense. Johnson and Maxime Talbot were the clear targets for the New York Islanders all game. The Islanders were chasing Talbot around at almost every opportunity and was nearly suckered punch by Matt Martin that started the first brawl of the game. Martin grabbed a defenseless Talbot from behind and as soon as Martin was about make contact with a hard right punch, Talbot reacted just in time to put his hands in front of his face to brace the punch. It was almost identical to Todd Bertuzzi attacking Steve Moore, years ago. If Talbot didn’t see Martin at the very last second, it might have ended up that badly. Martin’s near sucker punch led to a brawl in center ice with Mike Rupp, Deryk Engelland and Pascal Dupuis getting ejected. Things then turned nasty in the third period with the likes of Engelland and Rupp out of the game. The second huge brawl broke out at 4:47 in the third period and was sparked by Islanders enforcer Trevor Gillies who delivered an elbow to Eric Tangradi as Gillies came with speed from the other side of the ice that left Tangradi dazed and out it. Gillies then attacked Tangradi who was clearly injured and Gillies still delivered punches to a defenseless Tangradi when refs were trying to break up the scrum. Gillies act was even more gutless moments later as Tangradi was then laying on the ice getting attended too…. Gillies taunted Tangradi from the runway. That was the worst part of this mess tonight. In this melle Haley had two fights, first with Max Talbot and then with Johnson as Haley charged after him and both players dropped their gloves and started punching as Godard came off the bench. The Penguins finished with the game with 6 skaters and 2 goaltenders. They are lucky at this time to only leave the game with one known injury as Eric Tangradi has concussion like symptoms, Dan Bylsma said in post-game comments. Kris Letang, Jordan Staal and Tyler Kennedy scored power-play goals for Pittsburgh, who will play at the New York Rangers on Sunday afternoon. The Penguins fall to 35-18-4, 74pts with the loss. *Dan Bylsma will receive an automatic one game suspension and $10,000 fine, pending league review.